Can you take us a little into you background? My name is Koffi Idowu Nuel. I am a comedian, an actor and a singer. First in a family of four, born to a Togolese mother and a Nigerian father from Ibeju-Lekki, Lagos, I attended Kuramo Primary School, Victoria Island but because I was naughty, my mother sent me to Molusi College, Ijebu Igbo, Ogun State. I proceeded to the University of Lagos to read Chemistry and while in the University, I joined Theatre 15, a theatre club. That was where I groomed my skill; first started as a stage actor, then fully blossomed into a comedian and of course, music came along the line while having fun. Since my fans love my musical ability, they encouraged me further to take it more seriously. What inspired you to go into comedy? I didn't exactly go into comedy. Comedy just happened. When I was in school, I was in Theatre 15, so it was while doing all the things we were doing that the comedy inclination came and I was just having fun. Gradually, it metamorphosed into a comedian that would open up a show. Then before school was over, I was already getting paid as a comedian, as a master of ceremonies for my friend's gig, dinners in the department, faculty and occasions, so by the time school was over I moved full time into the trade zone because when I was in school I was already getting gig from outside school, like wedding and launching. I started paying my bills even in my final year in school. I was not asking my parents for anything and even when I felt there was need for me to find my certificate and look for a job, my hands were already filled up. What is the Theatre 15 about? Theatre 15 is a theatre club in the University of Lagos where students meet after lectures and have a theatre production and rehearsals about things that are happening in the campus environment. KB of Trybesmen used to be a member, Teju BabyFace, Tee A, Gbenga Adeyinka, Blackky back in the days and a host of others. It was an avenue to groom yourself to learn to be a master of the stage and that was where I spent most of my quality time. So, after lectures I am on my way to rehearsals to do one thing or the other. And that was how I started. We also did the TV drama, Twilight Zone. It was a drama centred on school happenings. That was where we all started from, myself, Yaw, KB, Biola and others. It was while we were doing that, being the character that I was, I used to sing and mix songs a lot, so people liked it, and I started doing my own songs and work. Was comedy part of your childhood dream? I never saw a future called comedy. In fact back then, I never knew what comedy was, I never knew the word 'comedian' until probably in 1999. I was just having fun as a kid because I used to be very naughty, very out spoken and humorous. In fact nowadays when I meet a couple my old friends, they say ah! we knew you were going to turn out like this, but I didn't know, I was just me. I was just a loving and fun-to-be with kind of guy. Even in the neighbourhood, you will hear, Oh Koffi! Oh Koffi because everybody is a friend and whenever any of them has a party, they will be like, 'Koffi, the Awadakerikeri man, you will be the MC'. It just turned out that the profession became serious and here I was doing this in this 21st century. The reason anybody joins anything is because it brings him glory, fame and fortune. If I could do this thing so well and already everybody around me were suggesting that I am good in it, I had to pursue my dream of eventually becoming an entertainer because every young person has a dream. Though at some point I wanted to be an entertainer and not a comedian, I enjoyed what I was doing with entertainment. I was a good writer, I ended up becoming a good stage actor and I just wanted to pursue that aspect of life in the writing and acting, but I didn't know I was going to turn out to be an outstanding comedian and of course a singer I was also having fun with it and that is why we are here today. What was your parent's reaction when you chose comedy as a career? Initially every parent fears for the future of their children. It was not the comedy, it was the fact that I was acting and taking theater seriously. And my mum was like, 'what is wrong with this boy', but by the time she saw I was indeed pursuing my dream, I was focused, I was not doing bad and I was paying my bills, she told herself that, 'it's like this boy knows what he is doing'. so, she let me be. Besides, my dad had no problem, whatever you want to do, pursue it and meet the conclusion. Can you believe that few years later when it was time for me to go and serve, my mum was like, 'what are you going to serve? Kilo fe lo se nibe (what are you going there to do), you better stay at home and face your business', and I was like, 'but you were agitating a lot for me to go and serve before now', and she was like, 'abeg, abeg, green white green tokan pariwo kiri (this green white green you have been shouting around), you better face your business'. But I told her that though my business is doing well, I must still go and serve my nation, which I did. At that point, she realized that if I could pay my bills, then this is a future. As a matter of fact, my younger ones at that point, who were not doing well in school, she told them that, 'you can see your brother is doing well, you better be like him'. In fact one of my younger ones has a drama group now, and the other is in the arts school. I personally believe there is future in the arts and really we can see now that there is future in the arts. The sciences are dead in this country. I don't know about money, but I am sure comedy has brought you fame. How have you been coping with fame? I am more of an indoor person. I am an introvert. So with that background, I have been able to manage fame. It doesn't get to me. I don't know how you see us as famous but I don't see myself as thus. I am an easy going person and I just live as the day goes. I do not pursue any big train, I like God to take me on the ride. Really, whenever the same people who saw me 10years ago see me today, they will be like, 'guy, you no dey change, you are still your old self, you behave humbly and young', and that is me. I don't fake what I am not. If I must have something, it is not because it is in vogue; it is simply because it is necessary and it helps my business to grow. For instance, the reason why I have DSTV is because I do Musical Video Productions and I must be on time on what is happening in the area. If not, I will still be watching NTA. So fame for me is not a big deal, it doesn't get to me, I am just my normal self. 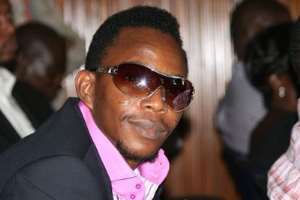 With or without fame, I am still Koffi. Indeed, many entertainers have created that impression but I don't follow the bandwagon, I follow God's direction and I have been able to manage fame. You mentioned that you do musical video. Shed more light on that? Oh! Where have you been? At least, right now, I think I have about 15 videos in this country and people know them. From mumu, to aroma 1,2,3, to green, to you dey run, they are plenty and am presently promoting some now. How do you get the inspiration to put your jokes together? My ultimate inspiration is from God but my environment supports that a lot. It is things that I see around me that inspire me in writing my jokes. We can talk about Presidency, to ministers and many other things that happen in the society. The things we read in the papers and hear on the news are also part of what makes my jokes. That is why my humour is a bit directed towards the intellectual. I hardly tell beer parlour's joke. I read a lot, I perceive a lot and I see a lot, these things reflect in the things I say. I always tell people that God is the ultimate comedian, God is funny and it is from the abundance of what he have that the give to us. The name 'Koffi', how did you come about it? So she named you Koffi? That was why you decided to brand the name? I didn't brand the name. Your name is your name, your name is Esther, and there is nothing you can do about it because it is your name. It is not a stage name. I was born and named Koffi. What is your Yoruba name? I understand comedians are coming up with an association? Yes. The information I have is that we are starting an association. That is all I know. I have actually taken it upon myself, if others are not willing to. We have decided to sanitise the industry before it collapses. All we see is that a lot of industry suddenly reach a point, it collapse. You now wonder what happened to that industry. It is because some things and errors were not checked from the onset. When the industry now reaches it peak, those things that you didn't check will constitute problems and crumble it. So, now that comedians are getting new waves, recognition and what they need, we need to checkmate the industry. If not, if we carry it to the next generation, we would be infected worse than we could ever imagine. Nollywood suffered a lot of setback last year; the music industry also has its own fair share of the lapses. All these problems sprang up because they are not together. There is no cohesion until recently when some music artistes started collaborating in order to address the issues. World over, there are lots of associations; there is the Rotary Club. There is Rotract Club, there are different associations for different professional bodies. All these are geared towards the development of the members. If we allow piracy to continue, it will suddenly get to a point where people would not want to talk to people. This comedian would not want to talk to that comedian and they will start drifting apart. When this happens, you will notice that the brotherliness of comedians will break and the reason why comedians are growing is because we are together. And that is why musicians are copying us and are beginning to see the relevance of being together. Also, if this is not checked, there will be a lot of bad blood and when bad blood comes in, people will drift apart. Before you know it, a comedian would want to do a show for N150, 000 and another comedian would collect N20, 000 because he doesn't like him. If this begins to happen frequently, comedians will begin to look tattered and the older ones will be the only ones there. Consequently, the future of the association will be destroyed because the older ones will later fade away and only few ordinary people will come in and do nonsense. For instance, there is a set of Alli Baba and the others. Those are the grown ones. Then there is a set of the intermediates which includes the Basket Mouths, the Koffis, the Gordons, the AYs and others. And there is another generation coming after them and most of these guys are the ones with the problem, the Elenus, the Seyi Laws, the Shakaras and others. The problem with this generation is that most of them lack originality. Many of them are putting on our jokes and the jokes of those coming behind them. Now, if we don't sanitise that generation, it means that generation will kill the industry. In the Comedy industry, do you have caucus groups? If there are 50 known comedians, you will see at least 30 in a show. Now if there are caucus groups, will all the 30belong to one? Personally, I have, in one way or the other, done something with virtually every comedian in Nigeria and I know that is what most of my colleagues do too. Some people think there is a caucus thing in the industry because they see close elements working together. It is only natural that it is the people you see everyday that you mostly relate with. But that does not mean when others come, you won't extend your fellowship to them. For instance, for the past two years, everytime I do Burstin Loose, I have my close friends with me. The first time I did Burstin Loose, I invited Tuface and he didn't turn up but this year, he said he will make it. I have a couple of several comedians in the first one. The following year, another set of comedians. This year, I still have another set, so where is the caucus? The problem is that of availability. Most of these people are not available. What major challenges have you encountered as a comedian? None. Well, as a human, how can you not encounter challenges? I am a very optimistic person. I don't see challenges. I see stumbling blocks as stepping stones. I believe everything a man goes through is being ordained by God. I am a patient person; I wait for God's time. I let things take their own course. I will give you one specific example. My second album has a single track called workerman. I sang that song, did the video, promoted it and did everything I could do to get that brand name workerman but it didn't work. Naturally, some other person would have been frustrated but I know that everything happens in its own time. so, I chilled. Right now, I am not promoting the lead for workerman but when people see me, they don't call me Koffi, they call me workerman. Ironically, it is funny because it was when I started promoting my other one Candyman that they started calling me workerman. You see when things don't work out at a time, don't allow that to pull you down. I have never allowed my problem to pull me down, I just let take things take their ride. Looking back at your career, have you had any regrets so far? Never, not even one. I do what I do passionately and I love what I am doing. There is nothing better than loving what you do. What are the lessons life has taught you? Life has taught me to be who I am and never change being who I am. Life has also taught me to appreciate mankind and love God, and to treat everyone with respect. How do comedians contribute to the development of Nigeria? In the things we say. Comedians are the boldest when it comes to saying certain things impromptu on a spot. Musicians have to take their music to the studio to record it and probably get it banned. But in comedy, once a comedian talks, it drops. And some of these comments are what many public figure fears; as a result they try to behave in order not to be used for jokes. Everything that happens, we have a joke around it. In that way, the society is informed, the society takes note, the society gets prepared for the future occurrence of such things. There are many things we don't fight physically but when we write and say our jokes, it hits those people concerned and they re-adjust. For instance, nobody can come and try a Reverend King stunt anymore because we talked about it. Also, what we say can be used as a reference point. That is, we help people to keep abreast of history. Compare the Nigeria comedy industry with its counterpart abroad? Nigeria comedy is just starting, not that being funny is just starting but the comedy trade as a business. We are still here celebrating stand up comedy but it's lots more than that. In United States for instance, they have segmented it. They have stand-up comedians, they have the acting comedians, they have the clowns, they have the caricature. All their different element of comedians are doing well over there. But the Nigerian comedy is still based on the one that stays directly on the stage and talk. We have not yet gotten to that stage that we respect clowns. Here, we see a clown as a yeye nonsense, kiddies party people. But in abroad, clowns come on stage, fully dressed in their costumes. They do mockery and mimickery and the audience participate with them to say who they are. Some people are facial comedians; they come to do facial expression. Some do body movements and this is what they are paid for. We are yet to get there here. But recently, we have started having something close to different department. All these are geared towards improving the industry. For now, we are still crawling. Well it is not an embarrassing moment. Some people say it is embarrassing when fans mob you, ask for money and your autographs. It is part of the job. If you are not famous, they won't come to you. They just want to be part of your success. It is a blessing, and so you must learn to manage it. You don't have a place you hang out? I don't hang out. I don't drink. I don't smoke. I have friends but they know my boundaries, they understand the kind of person I am. Anybody who wants to see me comes here. I don't go to restaurant, or club, or whatsoever. I am an homeboy. If I don't have anything to do outside, I am in my home. The truth is, you will never have problems that way. Once I finish here, I go back to my bedroom where I brainstorm and table work. Anything I get. I don't have a specific food. The reason being that when I was young, I ate beans a lot but contrary to the general belief, beans didn't help me grow taller. So I just eat anything that comes my way now. Besides, I am not a food person, I don't eat much. I have being maintaining this stature for about 15years, and this is how I want to remain. What is her name and where is she from? Her name is Kofo, she is from Ogun State. We have a daughter.